The twin necks of the high-action Sevesi number four. Bill Sevesi Collection. Bridge details of Sevesi number four with star fret markers and roller volume controls. Bill Sevesi collection. The Popularity of Spanish and Hawaiian acoustic guitars during the 1930s inspired designs for a bigger sound to perform in larger bands and venues. These innovations ranged from larger jumbo and arch-shaped F-hole bodies with steel strings to metal resonators and the first electric guitars using pickups and amplifiers. This double-neck guitar built by Auckland bandleader Bill Sevesi about 1946 was among the first electric guitars made in New Zealand. Sevesi had already designed three lap steels. The first, in 1938, located the fretboard on top of a frame that also housed a four-valve 10-watt amplifier, speaker, and the band logo for Bill Sevesi and the Islanders. He was aged 15 years, an apprentice assembling radios at the Westinghouse factory and studying electronics at night school. The Westinghouse engineers helped put together his first guitar. The pickup was made from the magnet and coils in a radio earphone. Sevesi: "The earphone had two coils, a larger one and a miniature one. They had a circular magnet underneath them. We used the magnet and winding for a pickup." The result "sounded awful but I played it for a while and then made the white guitar." The white guitar was a single-neck six-string with a deco box-shaped body, and a large metal cover providing a hand rest over the pickup. Sevesi played it till the late 1940s when he built two versions of an eight-string double-neck modelled after a Gibson EH150 Hawaiian. He started playing the second double-neck, which became known as number four, and gave away the rest. He has played it since. Number Four was a 22.5-inch (572mm) small-scale laid out on a flat slab of seasoned matai dug up from a timber yard in Kingsland, Auckland, where it had soaked in the cabbage tree swamp. 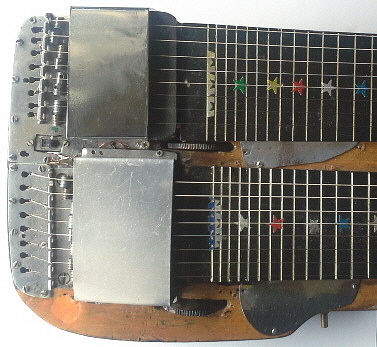 There were two eight-string high-action necks, two pickups with a horizontal roller control for each volume, and a unique Sevesi roller bridge design to reduce string breakage. Bunny Milne at Commodore guitars provided the fretboard grid of coloured stars printed on paper. There were eight pole pieces on each pickup, hand-wound 44-gauge wire in two groups of four wired to different poles to increase output. Its 8000ohm output matched top-end modern pickups. Sevesi played his number four on numerous studio sessions after 1949 in backing bands for singers including Tex Morton, Mavis Rivers, Daphne Walker, Luke Simmonds, Vince Callagher and Ronnie Sundin, and recording as Bill Sevesi and the Islanders – at last count he had recorded more than 50 LPs, plus more 45rpms and 78rpms. Hofman Electrostatic with electrostatic pickup, and power/signal cables coiled round a knee rest. Neville Claughton collection. Nelson shop apprentice Ray Simpson built his first electric guitar aged 17 in 1942, a square-shaped lap steel inspired by a magazine advert for a Gibson. The pickup was built using the horseshoe-shaped magneto from a car engine. By 1945 he had turned his attention to the electrostatic pickup design used on several prototypes by Gibson during the 1920s and popularised by Hawaiian steel guitarist Sol Hoopi. The first Hofman Electrostatic featured an electrostatic pickup, and mains-powered on-board valve preamp. The pickup comprised "earthed strings over a shielded point with 180 volts DC" – essentially a condenser microphone. There were two leads between the guitar and amplifier to carry the signal and power. Simpson: "As the string vibrated it altered the capacity which was amplified and came out as pure sound from the speaker." They were a bit before their time, he says. "The sound of them was too pure because there were no coiled magnets." English guitar designer Alan Entwistle remembers the Electrostatic as shaped like a modern Steinberger and "interesting but dangerous". Simpson built several Electrostatics during the next decade, and played with his brother in a 1950s Nelson dance band that featured three of the guitars. 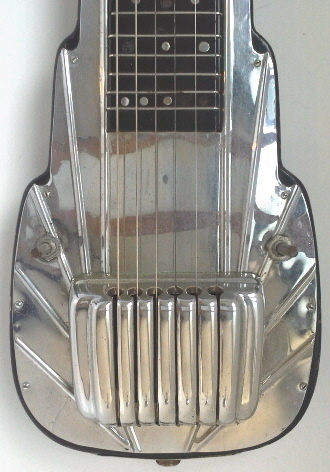 He also constructed a dozen or so cast-aluminium resonator guitars, some branded as Hofman. By 1960 Simpson was packing his family for Auckland and a job building guitars for Jansen. A version three of the Commodore lap steel with volume and tone knobs, trademark celluloid-covered cast aluminium body and fret markers. Commodore six-string dating from the late 1950s with four-way push-button tone selector and Milton vibrato. Taihape panelbeater and spray painter Bunny Milne built his first lap steel guitar about 1945 and made several more in his garage before moving to Auckland in 1957 to start commercial production from a factory in Grey Lynn. 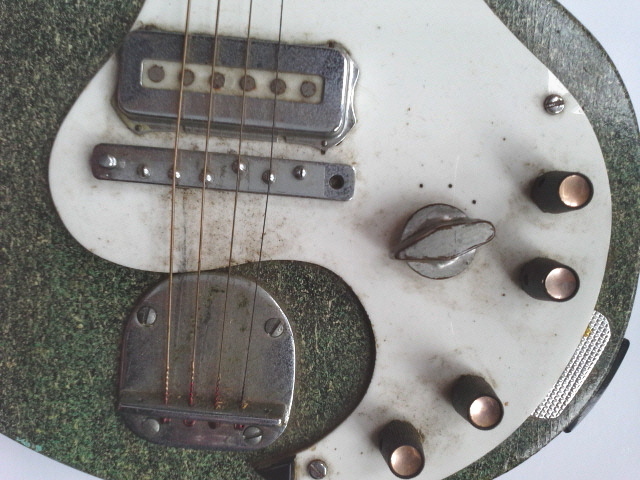 Prototypes included a black Rickenbacker-styled Hawaiian with aluminium body, single pickup, volume and tone controls, and a fretted fingerboard despite its high action – later models would use guide markings without fret wires. A second prototype was oblong-shaped and fitted into the lid of its carry case. It introduced a three-way toggle switch to select combinations of the two pickups, and Milne's first use of his trademark cellulose finish. His first production model after 1957 was a six-string steel guitar with rimu timber body, chrome on copper fittings, vertical controls and inlaid frets. Anodised aluminium fret boards were later used on this and subsequent models. Bill Sevesi assisted with design of pickups. A second eight-string model with roller controls and adjustable bridge followed, and featured on recordings and radio work by Bill Wolfgramm. This model was also sold under the Royal and Milton brands. Wolfgramm played through a Commodore 3 valve amp with eight-inch Rola speaker. 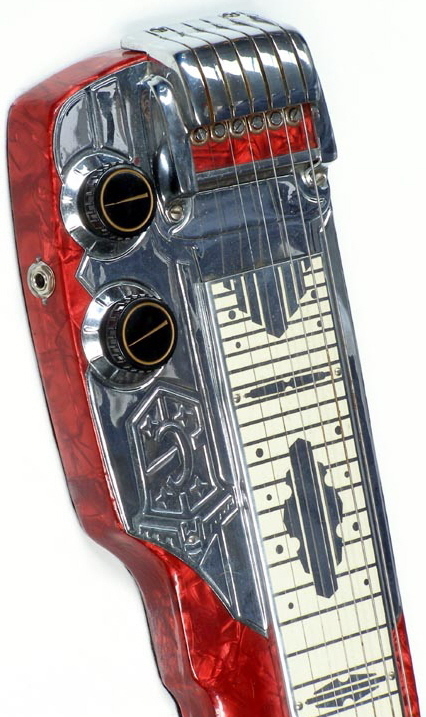 A third version of the Commodore lap steel with deep-red pearl celluloid-covered cast aluminium body was manufactured after 1956. Milne made his own dies and metal pressings, and carved various cover plates for the string anchor in wood to produce the die for pressing. Version four of the Commodore steel featured two pickups, mix controls and a clear lacquer mahogany body. 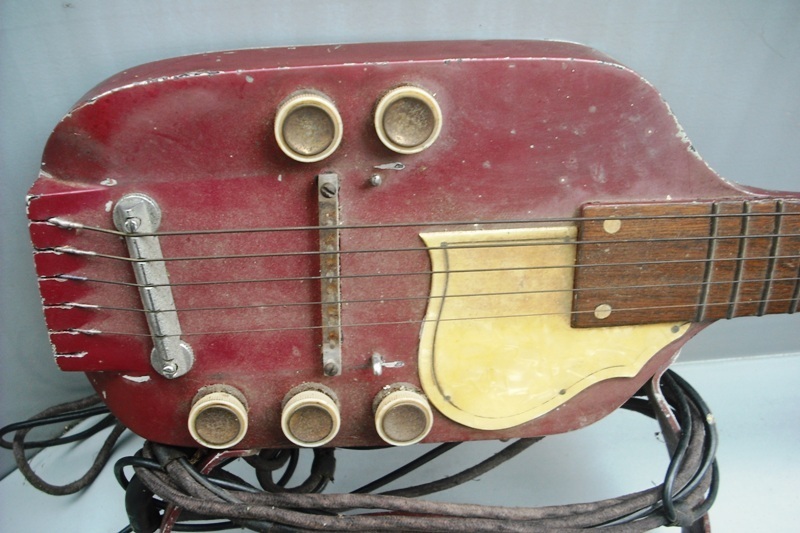 Early pickups were hand-wound and copied from a Gibson pickup. Milne later built a Gibson-style hand-driven winding machine using a lightbulb as a regulator to ensure even string tension. By the mid 1960s Commodore had expanded into electric and semi-acoustic guitars, bass guitars and accessories. Some Commodores were exported to Australia and the United States before production wound down as tariffs were reduced against Japanese imports. Some Yamaha guitars were assembled at Grey Lynn before Milne closed the factory and retired to making guitars at home. He built lap steels with mahogany body to order, solid-body six-strings including a four-pickup stereo guitar, some 12-string guitars, and a Gibson 335-styled semi-acoustic under the Ludwig brand. 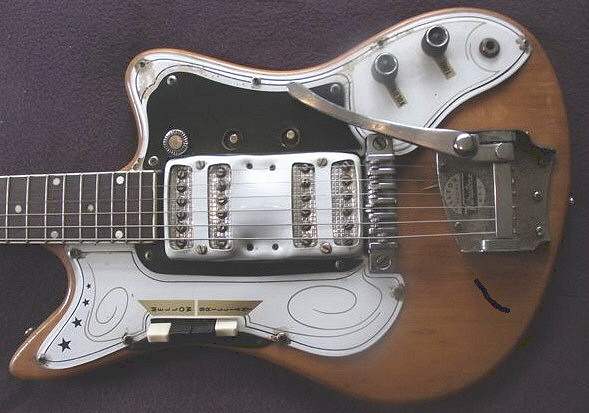 Six-string solids from the late 1950s included a Milne-designed vibrato, and four-way push-button pickup selectors. The Ludwigs were regarded as Milne's "pride and joy" and required considerable spending on heated moulds and formers. Very few Ludwigs were manufactured. Detail of Concord six-string guitar. Clarry Schollum collection. Radio technician and jazz pianist Benny Gunn started Concord in Auckland during the late 1950s to build office intercoms before branching into amplifiers and music equipment attracted by the big dollars of rock and roll. By the early 1960s several guitars including a bass were included in its diverse catalogue. The one or two-pickup H62 and H63 released about 1960 featured a "one-piece neck and body that eliminates the weak joint in conventional guitars." The H62 retailed at 33 pounds 12 shillings. Also available that year was a mahogany and plastic lap steel guitar modelled on the Gretsch Electromatic. It included a single pickup, volume and tone controls. Concord also manufactured scratchboards with two attached pickups to fit F-hole guitars. The Esquire six-string released about 1963 included vibrato and adjustable bridge, twin pickups, and a three-position tone lever to select tones. Complex pickup switching produced "an unique variety of tonal selections". The Esquire was available as walnut-toned sunburst or tomato red. Concord also built the Model 72 with a flick-switch to turn on built-in reverb and a knob to adjust depth. The matching Model 472 bass guitar with a 26 3/4-inch scale neck included two pickups, selector switch, and an attenuator-type tone control to cut extreme bass frequencies. Concord stopped guitar and amplifier production in 1965 as restrictions were lifted on imports from Japan. Jansen Jazzman III with top knob to control overall tone, and lower knobs to control pickup volumes. De luxe version with Jansen vibrato. Dennis Shearer collection. Jansen guitars was started in 1960 by Bruce Eady and Nelson luthier Ray Simpson. Eady was part of a long-standing Auckland family of music retailers. He tracked down Simpson after a migrant luthier from Germany was declined entry by the post-war government. Both Eady and Simpson were country music fans and started to produce semi-acoustic guitars alongside an increasing demand for solid-body electrics. By early 1964 Jansen had produced more than 2,000 guitars – 80 per cent of them solids. Bodies were made from New Zealand kauri, and necks from Nelson birch, New Zealand white beech or mahogany and North American maple. Fretboards were white maple, or Sri Lankan and Brazilian rosewood. All guitars were inspected by Simpson as factory foreman. The first Jansens were the short-scale Jazzman series – the so-called White Swan or Jazzman I, and the Jazzman II and III. The Jazzmans were shaped after the Fender Jazzmaster and Jaguar with their offset waist and shallow double cutaway. The Victor or Jazzman II manufactured after 1961 briefly introduced thumb frets, and provided twin pickups with push buttons to select rhythm, twin or brilliant tones. The Jazzman III used three pickups with anchored adjustable-height bridge, and four self-cancelling push-button selectors for rhythm, solo lead, brilliant and take off. 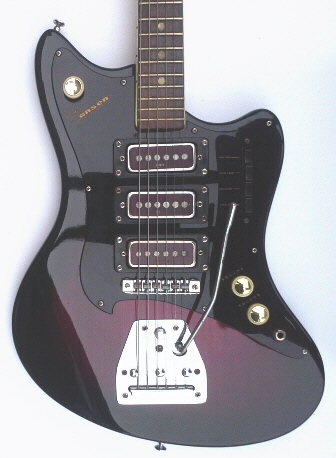 The de luxe model included a vibrato tailpiece modelled on the stand-alone unit on the Jazzmaster and Jaguar. By 1964 the Jazzman had gained an international reputation. Auckland jazz guitarist Bob Paris played a prototype with Johnny Devlin and The Devils before taking a Jazzman I to Australia. Max Merritt and the Meteors played Jazzman II and III guitars in Christchurch before moving to Fenders and Australia. Instrumental guitarist Peter Posa appeared in adverts for the Jazzman I. Californian surfing band the Surfaris visited the Jansen factory in Auckland before they toured Australia in late 1964 with their chart-topping instrumental ‘Wipe Out’ [played on a Fender Jaguar]. They took home a Jazzman III de luxe which years later appeared in the New York Hard Rock Cafe captioned as "played on tour of Australia 1964". Jansen Peter Posa thin-line. Dennis Shearer collection. Jansen would specialise in matching latest Fender and Gibson models while adding their own features. Gibson influences appeared in the semi-acoustic slim-line Starfire released in 1962 and modelled on the Gibson 335. 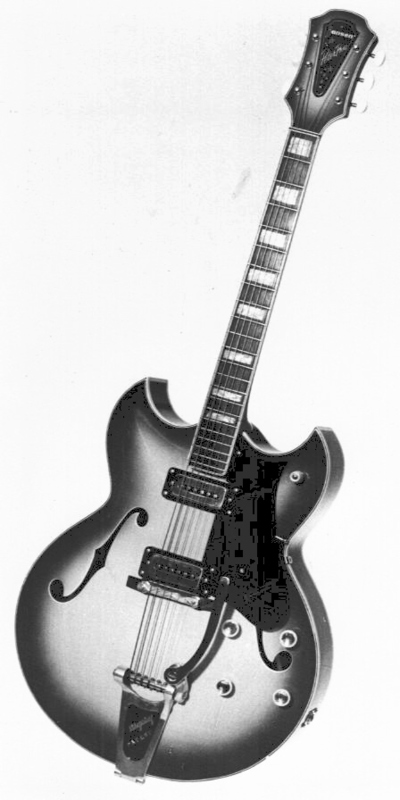 The Starfire featured twin DeArmond pickups, a Jansen-designed adjustable and removable neck, and was the forerunner of the Peter Posa model released during 1963. Posa was an international huge seller with ‘White Rabbit’ charting from London to China. Posa helped assemble guitars at Jansen and featured in adverts for the White Swan but mostly played a Gretsch. Simpson played in his backing band for a couple years. The Peter Posa F-hole semi-acoustic electric was modelled on Gibson's 1961 Barney Kessel Custom with double florentine cutaways, Bigsby vibrato, and an angle-adjustable neck. Two Jansen pickups were controlled with individual volume and tone controls. Another knob adjusted overall volume. A three-way selector switch under the scratch plate selected neck, bridge or both pickups. Described in the Jansen brochure as "beautifully styled to order of this discerning artist", the Peter Posa model was also available with three pickups. 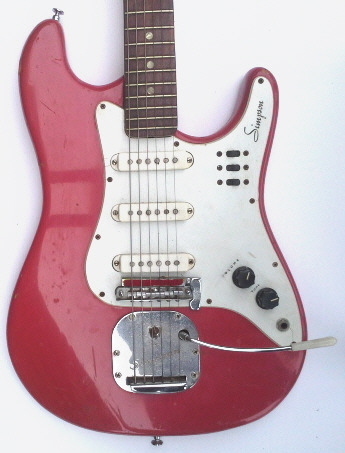 The Starfire line would later develop into the Stratophonic, and International released about 1968 with the first active Jansen pickups, and a transistorised mix-a-tone unit. Six individual switches and a standard three-position pickup selector provided "thousands of different sounds". Jansen Invader. Bruce Eady collection. Fender guitars provided many features adopted in Jansen solid-body designs. The Jazzman series drew on the Fender Jazzmaster and Jaguar. During 1964 Jansen produced the Scarab and Invader modelled on the Fender Stratocaster. The Scarab retained the offset waist of the Jazzman but introduced the Stratocaster double cutaway, and a four-way toggle switch to select combinations of pickups. It was a prototype for the Invader released the same year – that became Jansen's most popular model. The Invader (right) used three slider switches to select pickup combinations – a feature on the Fender Jaguar. There were knobs for overall volume and tone, and a second volume knob for the neck pickup. 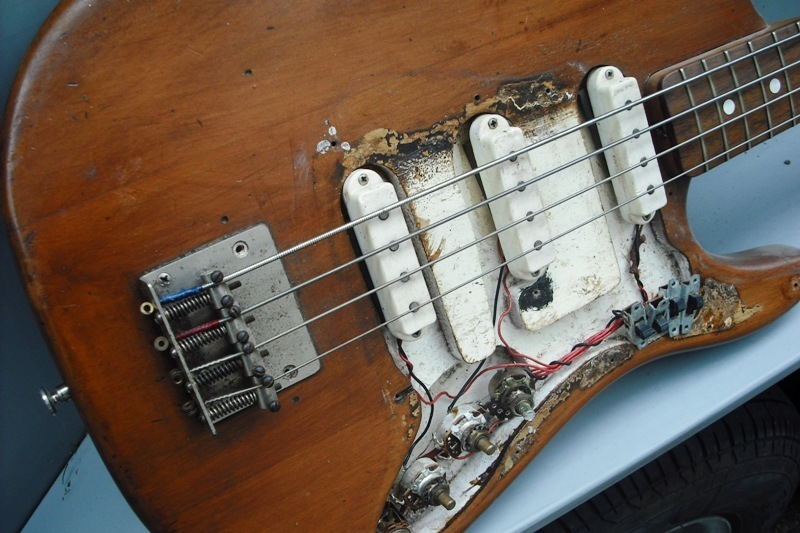 This second volume knob – sometimes rewired to link different pickup combinations – was among Stratocaster features appearing on the Invader that included an angled bridge pickup and slot jack plug socket. Body colours were Fiesta Red, Starlight Blue, Sparkling Green, Rosewood Red, Golden Sunburst, White or Deep Black. Retail price with case was 82 pounds 10 shillings. Jansen also produced the Invader Twelve, a 12-string version with twin neck truss rods retailing for 92 pounds 10 shillings including case. The Invader would gain almost instant prominence as Ray Columbus and The Invaders charted in New Zealand and Australia. The Invader 12-string featured on television clips for their No.1 singles ‘She's A Mod’ and ‘‘Till We Kissed’. Meanwhile the Fender influence was something not unnoticed at Fender head office with complaints after its sale to CBS in 1965 leading to withdrawal of the Fender agency from Jansen. 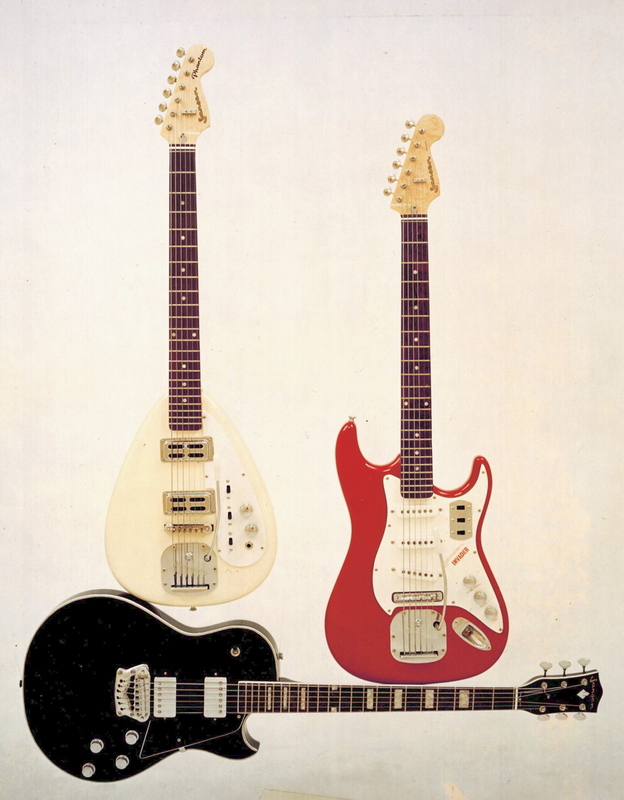 Also pictured are the Phantom (left), a six or 12-string model released in 1968 with twin pickups and phase switch. Styled after the Vox Mark IV Teardrop made for Rolling Stones guitarist Brian Jones, about 200 were manufactured and retailed at $90. The Les Paul-styled Session Man (below) was released in 1970 with two twin-unit Gibson-style pickups, and combination tailpiece and compensator bridge. About 20 were manufactured using bodies from Yamaha guitars in Japan under a rebranding deal. At $200 retail the Session Man was among Jansen's most expensive guitar – and among its last. Jansen International and Beat Bass, Beatmaster six-string. Bruce Eady collection. Jansen manufactured several solid-body bass guitars with its debut Bassman I in 1964 inspired by a Danelectro harp-shaped body that Ray Simpson had seen in a movie. It was followed by the one-pickup Bassman III and two-pickup Bassman IV with automatic tone selectors – both long-scale versions of the Jazzman. During 1965 Jansen introduced the Telstar bass, a long-scale Fender Jazz style with adjustable maple neck and three pickups. Also available were six-string bass versions of the Bassman III or Telstar. The International Bass (left) released in 1968 was styled after the semi-solid Gibson EB2. The International featured a twin-unit pickup, transistorised network for tone switching, adjustable damper at the tailpiece, and super-size machine heads. It was priced between $200 and $250. 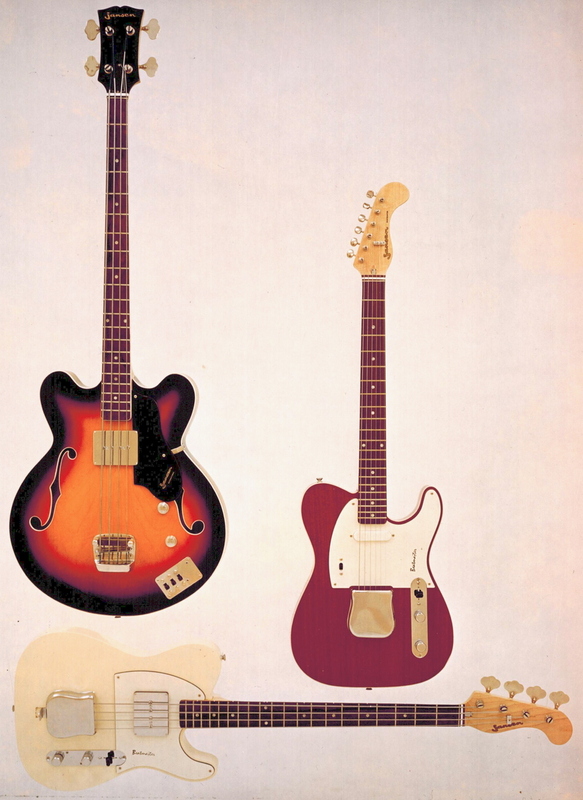 The Beat Bass (bottom), also introduced in 1968, adopted the Telecaster-style scratch plate and featured a twin-unit pickup, compensator bridge with damper, and three-way tone switching. It was priced round $200. About 1970 Jansen introduced the Rock Bass, a long-scale double-pickup version of the Fender Jazz. The Beatmaster six-string (right) drew directly on the Fender Telecaster design with its distinctive scratchboard, three-way toggle switch to select pickups, and controls for overall volume and tone. Jansen features were the so-called hockey stick-shaped headstock (used by Fender for the Electric XII 12 string), and a slide switch to put the pickups out of phase. Simpson Pan-o-sonic. Dennis Shearer collection. Fender-style bass by Ray Simpson from mid 1960s - with scratch plate removed during restoration. Neville Claughton collection. After Ray Simpson departed from Jansen during 1964, he started production of the Pan-o-sonic, a sleek variation on the Strat-influenced Scarab. Features included vibrato, a damper switch, three sliders for pickup selection, and overall volume and tone controls. The necks were made of Westland beech, and the bodies were former kauri school desk tops joined together. Between 100 to 150 were built during a brief couple years of production with exports to Australia, Japan and Canada. Simpson also built about a dozen Gibson Jumbo-style acoustics, some lap steels, and some semi-acoustic electrics modeled on the Rickenbacker 325. Body detail of original Commodore black lap steel prototype from 1945 - with volume and tone knobs removed during restoration. 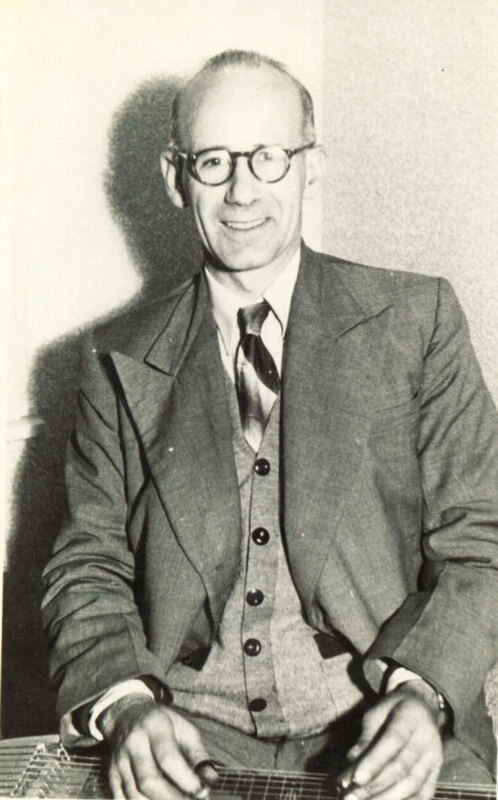 Ed Mee collection. The easing of import barriers in the mid 1960s marked the end of the first generation of New Zealand-made guitars. Jansen was the last to close their guitar factory, in the early 1970s. Many of these guitars remain in circulation – and demand – since The Surfaris tried out a Jansen Jazzman III. The Beach Boys took a Simpson Pan-o-sonic back to California from their 1964 tour intrigued by its Fender-like style. Commodore lap steels with their deco designs now fetch big dollars among local and international buyers.